The Manufacturing Institute estimates 3.5 million open manufacturing jobs between 2015 and 2025, and approximately two million will go unfilled due to a lack of skilled workers. To address these challenges, schools need to help students develop advanced skills along with core academic knowledge that can be applied in the work place and or at a higher level of learning. Companies are beginning to rejuvenate the Industrial Workforce with a new focus on people-centered technology applications. This supports the business goals of cost savings, quality improvement and competitiveness in tandem with other investments in data, equipment, Internet of Things and robotics. It demonstrates that industrial work offers exciting and rewarding careers. Career technical education (CTE) programs, once called vocational education, are being re-aligned to meet rigorous industry and academic standards. A CTE education is now being applied in schools, institutions, and educational programs that specialize in the skilled trades, applied sciences, modern technologies, and career preparation for both the workforce and a post-secondary education. Not only is the competition for talent stronger than ever before, but employers are also facing a new set of challenges: addressing the skills shortage, transitioning into a millennial-dominated workforce and keeping up with evolving industry technology and trends. Industry is now providing people with the advanced skills they need to be valuable contributors, which complements their investments in data and equipment and rejuvenates the image of industrial work for the next-generation advanced manufacturing workforce. Manufacturing is all about skills. Depending on what sort of manufacturing career students are interested in, most skills can be acquired in CTE programs, career pathways programs, apprenticeships, or an industry certification, which can often be earned in two years or less. If needed, students and workers can continue with college courses and degrees needed to design advanced applications and processes for the 4th Industrial Revolution. Manufacturing Day addresses common misperceptions about manufacturing by giving manufacturers an opportunity to open their doors and show, in a coordinated effort with the communities they serve, what manufacturing is — and what it isn’t. Manufacturing Day is designed to amplify the voice of individual manufacturers and coordinate a collective chorus of manufacturers with common concerns and challenges. The rallying point for a growing mass movement, Manufacturing Day empowers manufacturers to come together to address their collective challenges, so they can help their communities and future generations thrive. 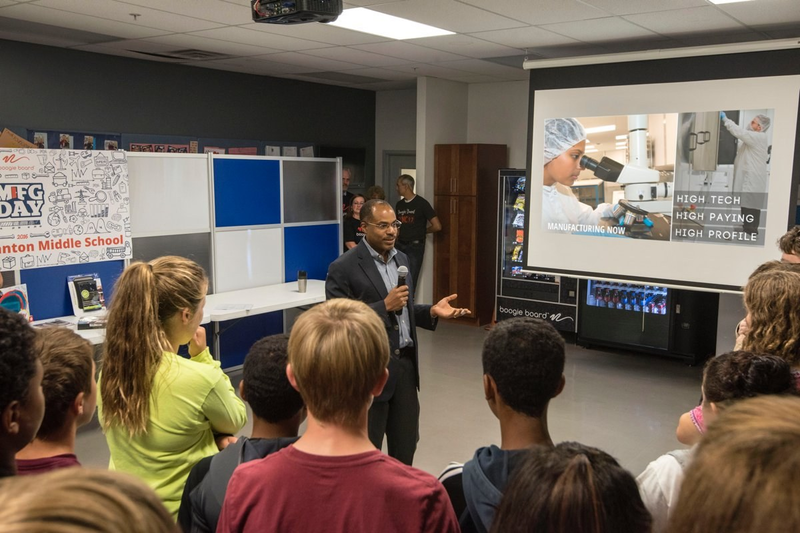 By working together during and after Manufacturing Day, manufacturers are addressing the skilled labor shortages they face, connecting with future generations, taking charge of the public image of manufacturing and ensuring the ongoing prosperity of the whole industry. Manufacturing Day occurs on the first Friday in October — this year Manufacturing Day is Oct 5, 2018. Learn how to create a successful Manufacturing Day event, which is typically a plant tour at a manufacturing facility or a career fair at a local educational institution. Organizations interested in becoming a sponsor or endorser of Manufacturing Day 2018 can use their organization’s communication resources to spread the word about Manufacturing Day. The National Association of Manufacturers (NAM), Canadian Manufacturers & Exporters (CME) and the Association for Manufacturing Excellence (AME) endorses the continued support for Manufacturing Day and invites their members and others to join with their communities in becoming more prosperous and globally competitive to address the challenges of the 4.0 Industrial Revolution. To learn about more about competing in the 4.0 Industrial Revolution using people-centric leadership skills to achieve enterprise excellence, join the Association for Manufacturing Excellence (AME) at the AME International Conference in San Diego, October 29 – November 1, 2018.